There are three main types Of cutting chips that Formed due to machining a work piece by using single point cutting tool either on Lathe machine Or Milling machine. The three common types of chip from a single point tool are. 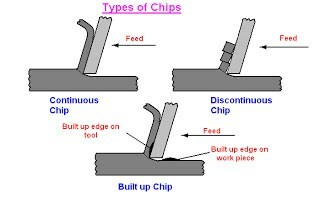 Discontinuous chips is formed by a series of rupture occurring approximately perpendicular to the tool place face’ each chip element passing off along the tool face the chip element’ in the form of small segment may adhere loosely to each other and becomes slightly longer. Since the chips break up into small segments the friction between the tool and the chips reduces’ resulting in better surface finish. These chips are convenient to collect’ handle and dispose off. 1. Brittle material , such as cast iron and bronze. Discontinuous chips are also produced when cutting more ductile material with the use of a cutting fluid. Continuous chips are formed by the continuous plastic deformation of metal without fracture in front of the cutting edge of the tool and is formed by the smooth flow of the chip up the tool face. Mild steel and copper are considered to be most desirable materials for obtaining continuous chips. The chips obtained have same thickness throughout. This type of chip is the most desirable. Since it is stable cutting, resulting in generally good surface finish. On the other hand these chips are difficult to handle and dispose off. use of efficient cutting lubricants. Use of tool material with low-coefficient of friction. This type of chip is very similar to the continuous chip. With the difference that it has a built up edge adjacent to tool face and also it is not so smooth. It is obtained by machining on ductile material, in this condition of high local temperature and extreme pressure in the cutting and high friction in the tool chip interference, may cause the work material to adhere or weld to the cutting edge of the tool. Successive layers of work material are then added to the built up edge. When this edge becomes larger and unstable , it breaks up and part of it is carried up the face of the tool along with the chip while the remaining is left over the surface being machined, which contributes to the roughness of the surface. The built up edge changes its size during the cutting operation. It first increases , then decreases, then again increases etc.